Day 1 is done and over with. I am sighing with relief. And grateful for all the family and friends that wished me luck today. It warms my heart to know that so many people are cheering for me. It all went quite smoothly, even though I arrived freakishly early and parked in the wrong parking lot. It was early even for my overly punctual self. Between the snow fall, a traffic pattern I was unsure of, and my nerves…Let’s be real here, I am surprised I didn’t camp out overnight. So I sat. In my Jeep. In the wrong parking lot. And listened to this podcast and watched snow plows. And these snow plows, well they weren’t plowing. They were just driving. Up and down, up and down, up and down. Up an down the empty aisles. They were not plowing snow or laying down salt. I think they were just logging miles on their trucks. Seemed like a waste of time, gas, and money. But what do I know about snow removal? I don’t even shovel my own driveway. Eventually, I had to leave my post as snow plow observer and actually begin my day. Overall, I would chock it up as a good first day. I only got turned around once or maybe twice. I must have had a lost expression on my face, since the janitor asked if I needed directions without even a prompt. If he only knew!! I found decent coffee just a short jaunt away, which is good for my on going caffeine addiction. The picture on my badge is horrid, as it should be. No need to make anyone jealous with a decent head shot. 🙂 I learned a lot of new names, I forgot a lot of new names. And I found the correct parking lot in which I am to park in. Oh, and somewhere in there I did a little bit of work. All of this before 4pm. Because by 4, I was sitting on my couch thinking about taking a nap and drinking a cup of hot cocoa. No nap though, hot cocoa – yes, nap – no. 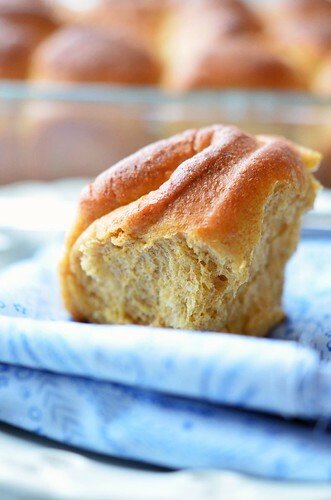 I needed to catch the last of the afternoon light and photograph some sweet potato rolls. Rolls I had baked the evening before that made the house smell delicious and cozy. Rolls I had been wanting to make for ages. 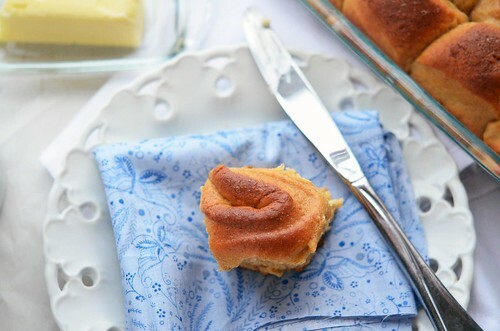 Rolls, that taste delicious straight from the oven or for breakfast the following morning. Rolls good with a pat of butter or a drizzle of honey. Fresh baked rolls…Let’s get baking! Extra butter for brushing onto fresh baked rolls. Whisk together all – purpose flour and whole wheat flour, set aside. 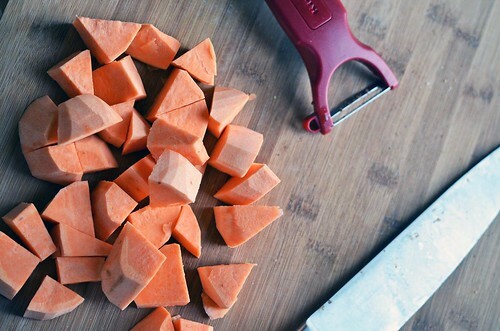 Place the sweet potatoe chunks into a pot of boiling water. Cook in boiling water until fork tender. Drain water and transfer to a large bowl. 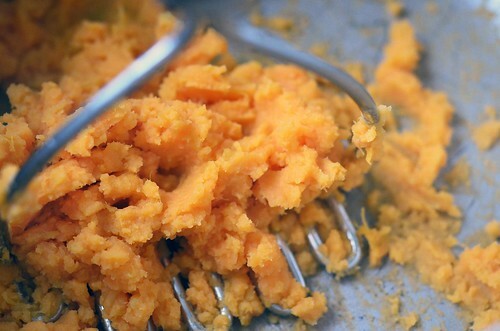 Mash chunks with fork or potatoe masher. Dissolve the package of yeast in 1/4 Cup warm water. In a large mixing bowl, with the paddle attachment, beat together the softened butter and remaining 1/3 cup of brown sugar. Beat until creamy. Add risen dough to butter/sugar mixture and continue to mix (use dough hook if you have one). 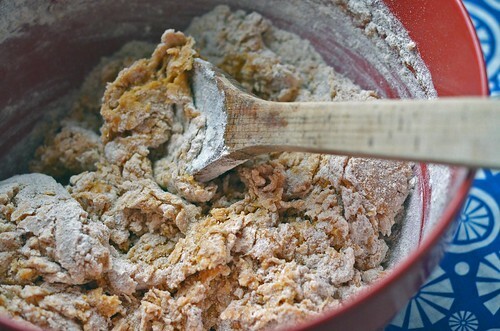 Slowly add remaining amout of flour and beat until flour is incorporated and the dough begins to pull away from the side of the bowl. Continue to mix the dough, on medium-high, for an additional 4 to 6 minutes, or until the dough is no longer sticky ( it will stick to side of bowl and dough hook). Spray bowl with cooking spray and place dough into bowl. Cover with kitchen towel and place in warm place and let rise for another 1 to 1+1/2 hours or until dough has doubled in size. Butter a 9×13 dish. Divide the dough into about 24 to 30 small dough balls. 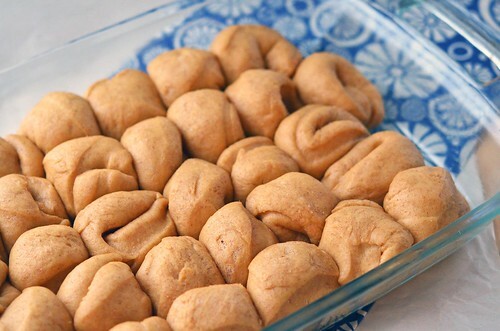 Place balls into dish, cover, and let rise for another 45 minutes. Preheat oven to 375°F. Brush risen dough balls with an egg whisked together with about a tablespoon of warm water. This will make them golden and shiney. Bake in preheated over for 35 to 40 minutes. Enjoy warm from the oven with a bit of butter and/or drizzle of honey. Store rolls connected and wrapped in plastic wrap or tin foil. Rewarm in oven or microwave.